There are two layers of yum in this super easy cherry-topped almond fudge. Beat almond paste and 1/4 cup sweetened condensed milk in small bowl until blended. Add food color; beat until well blended. Refrigerate about 1 hour or until stiff. Spread onto bottom of prepared pan. Place chocolate chips and remaining sweetened condensed milk in medium microwave-safe bowl. Microwave at HIGH (100%) 1 to 1 1/2 minutes or just until chocolate is melted and mixture is smooth when stirred. Spread over top of almond paste layer. Cover; refrigerate until firm. Use foil to lift fudge out of pan; peel off foil. 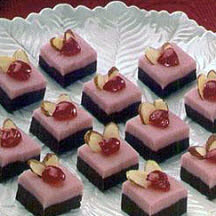 Cut fudge into squares; garnish with candied cherry halves and sliced almonds. Store in tightly covered conatiner in refrigerator.